Perhaps they should have been allowed to make contact before opting for public and ham-handed insults? I’m not a diplomat. I would like to assume the option was open for IKAME to submit a request in private, but I can’t say for sure. I have been in contact with my security and research department, they have found multiple volunteers for a early deployment to Semiki IV Zainou Biohazard Containment Facility from Malkalen and Haajinen stations. They have been informed to initially contact the Ishukone Watch at the station when arriving within the hour and then to fall under command of the Internal Watch, when the main teams arrive. You will find 10 Marines and 30 Caldari Light Marines and 5 of my brightest researchers available. The research team has been investigating IT related footprints and may be of use in the investigations take this specialty into account when assinging the researchers. I have delivered the team and my team has contacted Ishukone Watch and also Sheyan Mazaki to support Internal Watch efforts. Clearly. That doesn’t mean you don’t always represent your organization when you make statements in public. You do. You should never offer an opinion that will make your diplos have to work harder. You know, I never understood why people get so huffy when people ask for certain agreements and insurances. Not doing so is pointless risk and safeguarding everyone involved is entirely harmless. This is why I know I can deal with I-RED, Heiian Conglomerate etc. Well, if need be of course. They wouldn’t deal with me unless I provided insurances ensuring my end of whatever deal we’d had would be fulfilled and they would provide the same in return. It’s how I consider the Caldari in general the most trustworthy business opponents in the cluster, precisely because they can be trusted to look out for themselves first and expect the same from us. Thus we can all safeguard our interests by knocking out insurances and deals before putting either of our interests at needless risk, and thus we can trust each other more than the closest of brothers. Vastly preferable to asking each other to “just trust us” which is inherently a statement that should never be trusted, since it’s offered in lieu of actual assurances. I offer lessons in public negotiation, if anyone is interested. Looks like I might have to order in some more popcorn and hamberders. 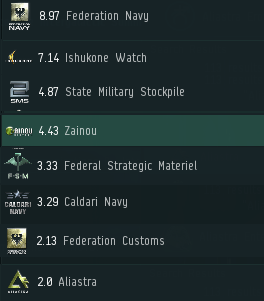 It’s easier to trust a scammer in Jita than you, Priano-“haani”. Your lies are known to whole IGS. And if someone still doesn’t know about them - feel free to contact me via NeoCom mail or start a separate thread, since it will be a different discussion. The thread derailer has arrived. Diana, not everything has to involve you. Most people can just look at a thread like this and say “Oh, that’s nice, you do you, do your containment protocol thingy, good luck”. But you’re legitimately obsessed with Makoto personally and it’s unhealthy and a bit disturbing considering you’ve been doing this for at least 4 years now. Please drop me a line, Captain Adams. I’m preparing to deploy now, but would like to avoid stepping on toes if I can. Both ARC and I-RED are playing a zero-sum game in spite of those affected. That much is obvious by the dissuasion of co-operation for sake of the bureaucracy displayed here. I’m sure those Aliastra Intaki workers care little for who is “subordinate” to who in this matter. I’m sure they care little for the Heiian Conglomerate’s thinly veiled attempts to claim credit for bringing in a representative of both Aliastra and the Federation. Nevertheless, they were indeed affected, and they do not benefit from these separate entities’ attempts to strangle one another with jurisdictional prudence and pretentiousness. It’s a shame, really. Despite my naïve predetermination of otherwise, neither the Consortium nor the Directive seem capable of brokering some measure of collaboration in these trying times even with the closeness of their sponsors, and it is – yet again – the Intaki who suffer. There is a reason for bureaucracy as stated in the interview by the ISD. In which I-RED selected representative Valdezi Sun’khar explained. We advise that involved parties adhere to Ishukone and Wyrkomi’s investigation protocols, should they require additional assistance. With this new threat any usual containment steps or external influence may escalate the effects and as such public information is best kept scarce. Transparency for the sake of transparency is unwise in situations such as this. The security and safety of our baseliner personnel, and those of our parent corporation are paramount. I-RED has, and always will, stand by Ishukone. ‘Safety’ in the State - at least as far as baseliner personnel - is not always synonymous with ‘healthy’ and ‘living’. Unless we so quickly forgot the measures the State wanted to enact with the Kyonoke outbreak, forgive me if I remain unconvinced that this ‘reason for bureaucracy’ is justified. You have an offer for a broker of cooperation, willing to adhere to a non-disclosure agreement. This is no longer ‘transparency for the sake of transparency’. EDIT: I’ll restate my original premise: There is no gain in attempting a unilateral investigation. ARC may be multinational, but to simultaneously use that as grounds for exclusion when you are willing to take on literally anyone who is on good terms with Aliastra and the Federation is contradictory at best and suspect at worst. The Directive is no more entitled to exclusivity in this investigation as a subsidiary [of Ishukone Watch] than the Consortium is as the subsidiary of one of the direct victims of this event. Moreso the exclusion of the Aliastra Intaki, whom you have zero jurisdictional bounds over. If you won’t collaborate, at the very least apply your policies equally, lest you risk one of the perpetrators waltz in and do more damage. You keep speaking of exclusion and exclusivity, yet I see no such comments from either side. Ishukone-Raata and the Heiian Conglomerate are more then willing to work together with anyone who is willing. With two simple stipulations, they’re not permitted to shout to the cluster what may be deemed sensitive information, and they cannot be an enemy of the State. As for your comments on our exclusion of Aliastra and the Intaki people, it’s far fetched at best. Ishukone-Raata has a long standing relationship with both the Intaki and even Aliastra. So before you continue with your assumptions I suggest you get your facts straight. Semiki, Lonetrek - With the recent events which transpired on the Zainou biohazard containment facility in Semiki, I-RED has deployed forces to the system alongside elements of the Heiian Conglomerate [HECON]. Within hours, an Astrahus-class citadel maintained by HECON for the purposes of coordination with I-RED and Ishukone, Ishukone Watch, Zainou, Wiyrkomi, and Aliastra officials will be fully operational. The joint I-RED-HECON team arrived in the system yesterday in a small force of Eagle-class heavy assault cruisers which escorted a Bustard-class deep space transport ferrying essential operation assets. Solange: The recent security issues aboard the Zainou station and the resulting cyberinfection of Aliastra employees in Semiki appears troubling. Cyber viruses which are targeted at cerebral implants are both an uncommon and potent weapon; one which can pose a danger to many people across the cluster if used in a greater capacity. I-RCN is joined today by Director Ku Mayaseki, CEO of I-RED biotech subsidiary Integrated Health Systems. Also with us are I-RED Director of Intelligence Operations Korbin Lavius and Executor Alex Hinkelmann. Welcome, gentlemen. Solange: Right, let us dive right in to it. Will each of you be willing to elaborate on your role or duties with the Semiki situation? Hinkelmann: Gladly. My direct involvement in the situation is limited. I am mostly coordinating communications between Ishukone officials and our own personnel. Mayaseki: I am leading a small team of cybernetics researchers and developers from IHS. While normally IHS maintains a notable amount of autonomy from greater I-RED affairs, we were called in to assist in ongoing investigation efforts at the request of I-RED leadership. We are, of course, glad to oblige, given our expertise in biotechnology, and cerebral cybernetics in particular. We are in close communications with the Ishukone-Raata Technological Research Institute IT team as well. Lavius: Right, I suppose it’s my turn. I am working alongside I-RED’s contingent of security forces which have been deployed to Semiki to provide additional reinforcements if need be. I-RED has opted to use forces from both of its current primary security contractors, the Oniseki-Raata Internal Watch and Revenent Defense Corporation. O-RIW will focus on ground operations while RDC forces will take priority of managing forces in space. Solange: Thank you all for your input. On a related note, is there any comment on the resources available by your teams? What sorts of qualifications do each of you and your groups represent, perhaps? Lavius: Respectfully, Miss Solange, we are unable at this time to provide specifics on exact resources on hand. We will note, however, that we have available to us cyberwarfare experts, technical support staff, cybernetics experts, and an appropriate security contingent for their defense with all the teams put together. As for qualifications, RDC has been a founding member of I-RED, before taking on a more PMC approach and shifting to becoming the alliance’s primary security contractor. As for I-RED as an entity, we unfortunately are very familiar with the likes of turncoats from within facilitating sabotage. In this respect, our security teams have venerable experience when handling internal security matters which Zainou has apparently had issues in with regards to the Semiki affair. Furthermore, the scope of this attack is concerning. One of the affected groups, the Aliastra corporation, happens to be a business partner of I-RED. I-RED stands in solidarity with Aliastra and their employees. We remain committed to promoting the livelihoods of all Intaki, and we look forward to working with Aliastra officials to bring the perpetrators of these crimes to justice. Mayaseki: I will defer most of my comments to those made by Mr. Lavius. Operational security and such. As for my personal qualifications, I graduated from the School of Applied Knowledge with a bachelor’s in human biology as well as cybernetics. I later returned to SAK for my doctorate in biocybernetics. My team for this mission is likewise well educated in the field biotechnology. Solange: Right, of course. Thank you! So, quite the buzz has been centered around the seeming lack of high-level coordination between Zainou capsuleer affiliate Itsukame-Zainou Hyperspatial Inquiries [IKAME] and the joint I-RED-HECON assembly. Is there a reason for this that any of you would be willing to share? Lavius: I’ll defer to Executor Hinkelmann for the answer you seek. Hinkelmann: I won’t presume to speak on our associates in the Conglomerate, but the stance between I-RED and IKAME is indeed an interesting one. I-RED has since its inception been a staunch supporter of Ishukone; coming up on ten years of active service to Ishukone and the State, from the warzone, to the frontier of Syndicate, we prioritize the safety of Ishukone’s assets, both personnel and material. As such we firmly believe in promoting certain stipulations and agreements between cooperative groups when it comes to operating with outside entities on a issue such as the Semiki one. IKAME is part of the Arataka Research Consortium, which is a multinational conglomerate who prioritize neutrality and transparency when possible. While neutrality and transparency in many aspects are commendable, we as an organization simply cannot approve of such tactics when handling the sensitive affairs of our parent corporation and her subsidiaries. I believe this is where the rift between our groups stems from - a difference in approach to dealing with this problem. Furthermore, there seems to be an idea that I-RED and HECON are attempting to step on the authority of other capsuleer groups. This is simply not true. Perhaps the wording of our public remarks could have been tailored better, but we openly agree to cooperate with any individual or entity that will abide by a non-disclosure agreement to protect the interests of Zainou and Ishukone. Additionally, such potential allies cannot be open enemies of the Caldari State, naturally. Solange: Of course, yes. It is an interesting dynamic indeed. You mention differing approaches to dealing with a problem. Can you elaborate on why this is so important to you? Mayaseki: I believe I can answer this question with regards to the safety of human life in mind. Assuming I-RED were to promote a transparent approach and openly discuss details such as the tools we have available to us, how we plan to utilize those tools, how we plan to implement strategies to neutralize any potential threats, and the methods by which we operate, then by default we forfeit the entire safety of individuals who could be affected by cyberwarfare against cerebral cybernetics. Taking such an approach opens up an avenue for the perpetrators of this cyber attack to stay one or more steps ahead of us, and attack again, with potentially greater consequences for whomever their targets are. This approach, with all due respect, is not only erroneous, but it is unethical. We owe it better to handle the situation with due discretion in order to protect the lives of our employees, those of our parent corporation and her subsidiaries, and those of Aliastra. This is not to say that I-RED will not release our potential findings at a later point in time. We will forward to the cluster at-large any pertinent information regarding the attack that may be of use to prevent future attacks like this, but for the duration of this current problem in Semiki we will refuse to publish any such information. Solange: Thank you for your comments Dr. Mayaseki. Lastly, it has been stated that I-RED is willing to cooperate with outside individuals and entities so long as they abide by certain disclosures beforehand and aren’t outright enemies to the State. With these considerations in mind, has there been any offers of assistance from outside groups? If so, how do these potential offers plan to be used? Hinkelmann: I believe thus far we have received an offer of support from Dr. Mizhir Devara of Devara Biotech. Dr. Devara has quite the resume under her belt, with collaborative publications done alongside ARC with regards to the Drifters. It is still too early to confirm or deny anything, but I will say that the offer is being considered and we will be in talk with the doctor soon. Recently, the Antumbra corporation has begun the process of anchoring a Raitaru-class facility near the Zainou station. Their leadership has initiated contact with our allies at HECON, and I believe discussion is ongoing. I cannot comment further on the matter. Solange: Thank you for your clarification Executor Hinkelmann. For now, that will conclude our interview. I-RCN will continue to monitor the situation in Semiki. For I-RCN, this is Selenna Solange. We in Ishukone-Raata have always been friends and allies of the Intaki people. Look at my capsuleer record. Look at the wars we have fought in the name of Intaki interests. The concerns of the Aliastra Intaki have not and will not be sidelined or excluded. In fact in our recent interview in Semiki with the ISD they were foregrounded as a significant part of our focus. Apologies, failed to address this. You sign the NDA, turn up in Semiki and we will work with you. Ishukone-Raata and Heiian Leadership would have to officially approve, but another Intaki advocate on the research team would doubtless be of benefit. If I were to offer to help out, could you send me a copy of the NDA in question? I’ve arrived in Semiki and have rented quarters at the Conglomerate Observation Post for the time being.